Ansonia Clock Co. , Royal Bonn case, "La Bretagne" One of the really large Royal Bonn cases at 15 inches high. This model was first produced in the late 1800\'s and shown in their catalogs thru 1915. It is a very poplar model, first because it is large, and also because of the open sections at the top just below the shell shaped crest. 8 day movement striking a gong. 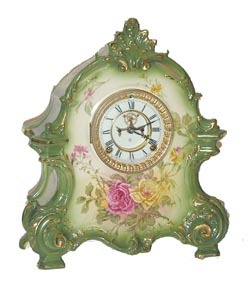 French sash, beveled glass, 2 piece porcelain dial with the open escapement feature.Decorated in greens, pink and yellow roses, and a nice array of gold around the edges. The sides and top of all these Ansonia porcelain cases are decorated on the top and sides. This clock was important enough for Tran Du Ly to devote one full page in his latest Ansonia Book. Case is perfect, properly marked front and back. Everything original and correct. This clock and the Royal Bonns following all came for a collection of fine clocks that the owner kept in a glass case. Ly-Ansonia, page 616.